Carex Health Brands has introduced the Bed Buddy Iso-Ball for the nonnarcotic relief of arthritis symptoms. The Iso-Ball can be used for isometric exercise as recommended by physical therapists and for the warming or cooling of joints. 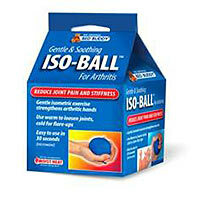 Developed specifically to relieve arthritis in the hands, the Iso-Ball features ThermaTherapy, a moist heat technology. The Iso-Ball can be warmed in the microwave or chilled in the freezer to provide joint pain relief during an arthritis flare-up. For more information call (800) 328-2935 or visit www.carex.com.